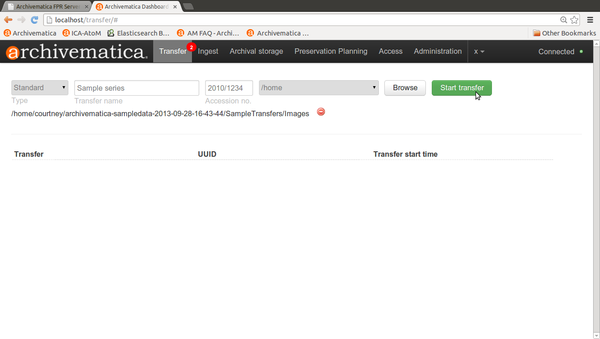 In Archivematica, Transfer is the process of transforming any set of digital objects and/or directories into a SIP. Transformation may include appraisal, arrangement, description and identification of donor restricted, private or confidential contents. 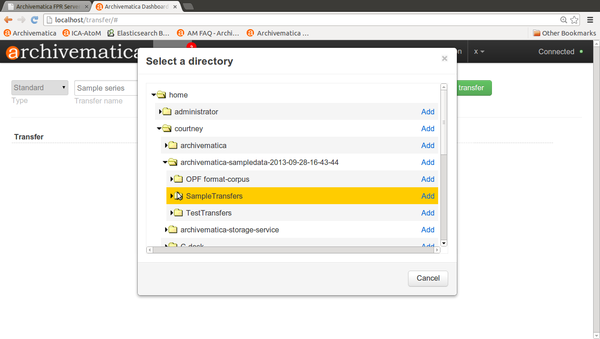 In the Transfer tab of the Dashboard, the user moves digital objects from source directories accessible via the Storage Service into Archivematica. See Administrator manual - Storage Service for instructions on how to set up shared transfer source directories. Once uploaded to the dashboard, transfers run through several micro-services: UUID assignment; checksum verification (if checksums are present); package extraction (i.e. unzipping of zipped or otherwise packaged files); virus checking; indexing; format identification and validation; and metadata extraction. At the end of transfer, the user creates a SIP from one or more standard transfer(s). Once this is done, the SIP can be moved into ingest or sent to a UM transfer backlog backlog for processing later. If your transfer is a DSpace export, please see DSpace export. If your transfer is composed of objects that are the result of digitization, please see Digitization output. In transfer tab, select your transfer type in the dropdown menu. Types include standard, unzipped bag, zipped bag, DSpace, maildir and Disk image. In transfer tab, name your transfer and browse to a source directory to select your object or set of objects for upload. You can concurrently upload multiple transfers composed of objects and directories from different sources. Repeat this step if your transfer is composed from multiple sources. If applicable, enter an accession number for the transfer. This is not a required field, but it will be indexed to allow for searching by accession number from the transfer backlog in the Ingest tab. Once all of your digital object sources have been loaded, hit the Start Transfer button for the transfer processing to begin. Note that you can remove one or more of the loaded sources prior to Start Transfer by clicking on the red Delete icon beside the directory. Another option is to create a transfer in a structured directory prior to beginning processing in Archivematica. The structured directory in Archivematica is the basic configuration of the transfer. If you just add a directory to the dashboard and start transfer processing, Archivematica will restructure it so it complies with this structure. There should be three subdirectories: logs, metadata, objects. The objects directory contains the digital objects that are to be preserved. The metadata directory contains the checksum, the METS file, and a submissionDocumentation subfolder, which can be used for transfer forms, donation agreements or any other documents that relate to the acquisition of the records. The logs folder will eventually contain logs generated when processing the transfer in Archivematica. You can create subdirectories within objects if desired. Please do not include submission documentation that has non-standard characters in the filename, as submission documentation names are not sanitized. Any filenames other than plain ASCII names may cause errors in processing. The structured directory should contain three subdirectories: logs, metadata, objects. Copy the digital files to be preserved into the objects directory. Note that you can create subdirectories within objects. Add submission documentation. 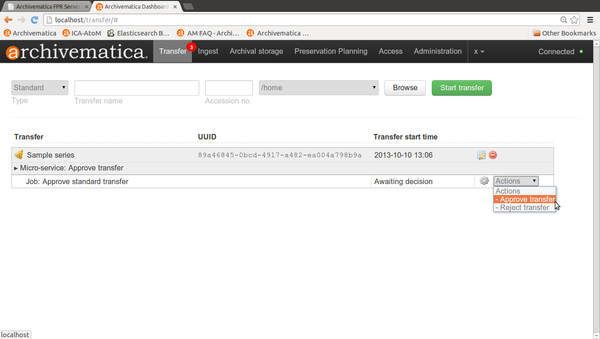 In the transfer you have just created, navigate to the /metadata/ folder and add a /submissionDocumentation directory. Add files to that folder like donor agreements, transfer forms, copyright agreements and any correspondence or other documentation relating to the transfer. Any SIPs subsequently made from this transfer will automatically contain copies of this documentation. In the dashboard transfer tab, the transfer will appear in the dashboard with a bell icon next to it. This means that it is awaiting a decision by the user. In the Actions drop-down menu, select "Approve transfer"
Click on the micro-service to display jobs that have completed, including the one requiring action. In the Actions drop-down menu, select "Approve transfer" to begin processing the transfer. You may also "Reject transfer" and quit processing. Generate transfer structure report (generates a directory tree of the original transfer and places as a text file in the AIP). Identify file format (this is the identification that normalization will be based upon, the user can choose between FIDO and extension or skipping format identification at this stage) See Format identification below for more information. Characterize and extract metadata (identifies and validates file formats; extracts technical metadata embedded in the files). If you have preconfigured it to do so, Archivematica will stop during this micro-service and allow the user to choose a file identification command from a dropdown menu. To learn about preconfigured options, please see Administrator manual - Processing configuration. Archivematica's file identification default is set to identification by file extension. You can also choose to skip identification and run it later, during Ingest, instead. A transfer that is in the middle of processing will show which micro-services have been completed (green) and which are in progress (orange). When a micro-service fails or encounters an error, the micro-service background turns from green to pink and a "failed" icon appears next to the transfer or SIP name. See Error handling for more information about how to handle an error. Once the transfer micro-services are completed, a bell icon will appear next to the transfer. This means that the transfer is ready to be packaged into a SIP for ingest or sent to a backlog, indexed and stored to be retrieved for processing at a later date. Option 1: Select "Create single SIP and continue processing". Option 3: Select "Reject the transfer". See Ingest for next steps. Archivematica's default is to allow the user to choose identification options to base normalization actions upon during transfer and then use those results to base normalization upon in ingest. However, you can set your preconfiguration options to allow for the opposite (skip at transfer and identify before normalization) or for both transfer and ingest to allow for user choice in the dashboard. Artefactual included the ability to skip identification at transfer and/or to change identification tool before normalization mainly to allow for the possibility that content in the transfer backlog may contain formats for which there are not currently entries in the Format Policy Registry (FPR). While the transfers are in the backlog, you can add rules that allow for the format(s) not identified or identifiable at time of transfer to the FPR so that, when they are processed through ingest, all formats will be identified and normalization attempted based on those identifications. There may be other use case scenarios in the future that this configuration flexibility facilitates. In general, we aim to include as much flexibility as possible when it comes to workflow choices so that the archivist is as central as possible to AIP and DIP processing rather than hardcoding and automating so much that the archivist is left less influence on ingest. Format identification is logged as a PREMIS event in the METS.xml using the results of running FITS tools (DROID, in particular), not the results of the tool selected to base normalization upon. This will change in coming releases. If you adjust your processing configuration settings, Archivematica will stop after format identification and allow you to extract any packages in your transfer. Additionally, you can decide whether you would like to keep the package with the extracted objects or not. This page was last modified on 14 October 2014, at 18:42.